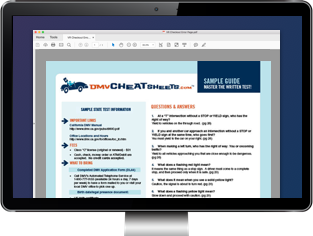 With the help of a study guide, you're sure to pass your DMV written test on your first try. Learn why it's important to study for your exam using different types of study materials, how you can study on the go (even in line at the DMV when you go to get for your driver's license), and how a study guide makes sure you pass your DMV exam. An on-road practical skills exam. The written exam is based on information presented in your state's driver license manual. While your manual is a great place to start studying because it has all the information you need, you may find that it's hard to dig through all of the information for review. This is where you may benefit from additional study materials. One of the huge benefits of a study guide is that you can print it and study wherever is most convenient for you. You can even review your information and test yourself in line at the DMV! With study materials like those provided by our certified partner, you'll get the answers you need to pass the test the first time around. To prepare, simply print your study guide and take a few moments to review the material. Studying the state's driver's manual or DMV handbook takes hours. Studying a condensed guide takes minutes. Make the choice that best suits your schedule. The specific items you need to bring with you. The knowledge to pass the exam. Show a list of DMV fees. Detail the steps on getting your license. List out what you'll need to bring with you on test day. If you don't have a study guide, however, you can visit our Apply for License section to make sure you get the information you need to know about applying for your new driver's license. If you've already printed a DMV study guide, you've already done your homework. All you have to do now is show up on test day with your paperwork. Don't take chances when it comes to getting your driver's license! With a study guide in your back pocket, you significantly increase your chances of passing your test on your first try.